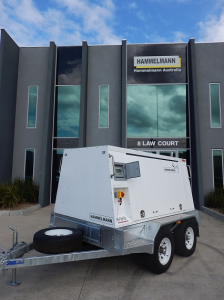 Hammelmann has completed it’s range of trailer mounted pumpsets by adding a 2 tonne trailer suitable for 50kW and 70kW pumps and a 3.5 tonne trailer suitable for 200kW pumps. So, whether its surface preparation, coatings removal, cold cutting steel or concrete, blast-pad works, rotorjet, pinjet, pipe or general cleaning work, we have a trailer unit to suit your requirements. To view the complete range of trailer units, please click here.